The beautiful Tara Theatre, just 10 minutes on the train from London Waterloo, hosts an incredible season to welcome 2019. Spanning comedy, music, dance and theatre, there really is something for everyone. For the first time this season, make use of their great ticket offers, including £10 Under 25 Tickets and their season offer, saving you 10% when booking three shows or more. Award-winning company Something Underground showcase their fascinating new play Of Our Own Making, rooted in the refugee crisis, exploring the nuances of radicalisation in the modern world. With exceptional music from Dirk Campbell, the play is being developed with boys from local youth groups in Earlsfield and opens January 30th. Oscar Wilde then arrives on the Tara stage. The comic masterpiece The Importance of Being Earnest, usually featuring 9 actors, will be performed by only two British-African women through the imagining of a thoroughly diverse and integrated society. Following the roaring success of The Moors, Two Gents Productions are back at Tara with their hilarious take on this classic comic text from 27th February. 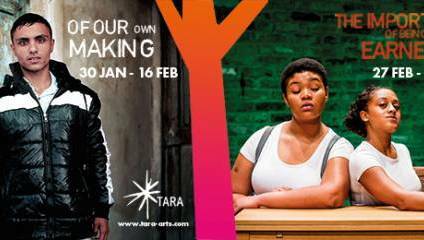 Visit www.tara-arts.com to book tickets now, and have a look through their amazing programme of events.